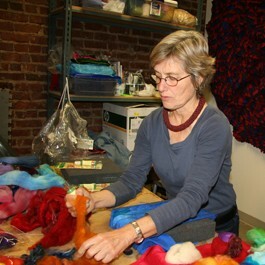 Mary Giehl is a sculptor, fiber, and installation artist whose work focuses on around the theme of child abuse. Her work is influenced by her experiences as a Registered Nurse in a Pediatric Intensive Care Unit where she often time cared for children that had been abused. With her work she wants to educate, agitate, and trouble the audience. Giehl received her registered nurse certificate from Monroe Community College and later received her B.S in Nursing degree from SUNY College of Technology at Utica/Rome. Giehl also holds a B.F.A and a M.F.A degree from Syracuse University. Her work has been exhibited throughout the East Coast and the Mid-West. Her work has also been exhibited internationally in Ireland, Canada, Ecuador, Italy, and Belgium. She has also received awards and grants from CNY Arts, NYFA’s Special Opportunity Stipend (7 times), Everson Museum, and many more. Her work is represented by Marion Royael Gallery in Beacon, NY. She currently lives and works in Syracuse, NY.